Set in the heart of the Alsace Region, around the village of Wettolsheim, our family estate encompasses a number of vineyards which total 14 hectares in organic farming. 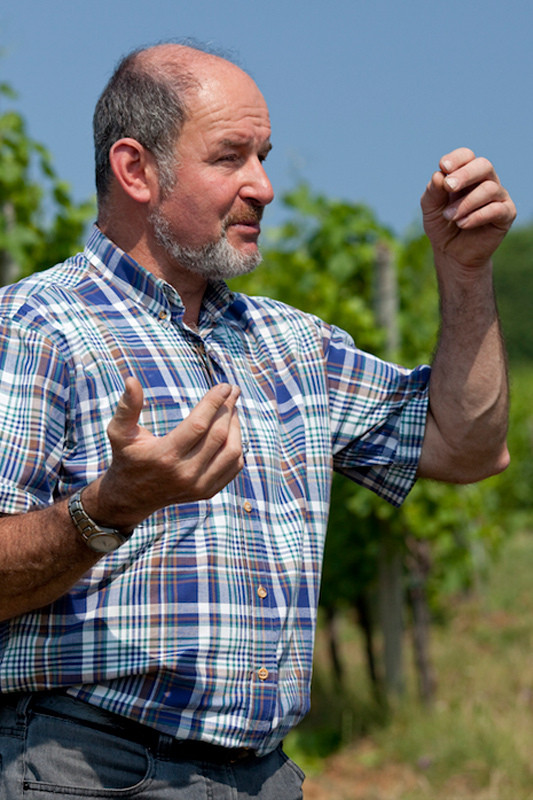 Marc Stentz represents the 5th generation of winemakers. Since 2007, Marc has worked with his parents Jocelyne and Etienne who opened the family estate towards international markets in the 80’s. We strongly believe that a great wine comes from the quality of the grapes. By observing and understanding of our soils, we have incorporated organic agriculture into our vineyard management practices. Our goal is to maintain and improve the fertility of our soils, while adding biodiversity to them. All with respect through biodynamic techniques and practices that respect nature and its natural rhythms. We are certified in organic farming (ECOCERT FR-BIO-01 Agriculture France) since 2010. 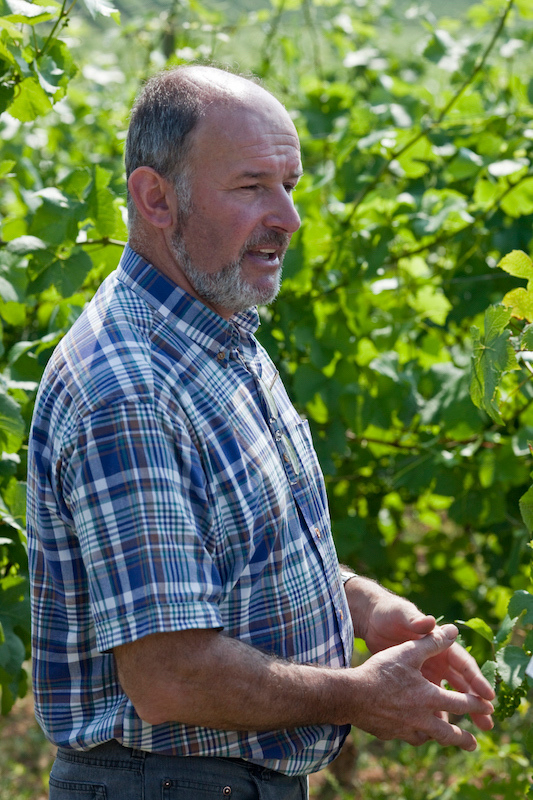 The new european regulation for organic wine-making which is apply from the 2012 harvest improves the transparency for the consumer. Organic wines are identifiable by the EU organic logo. Thus, we promote the sustainability of species and plants that give harmony, add richness and overall harmony to nature. Biological agriculture allows the interaction between earth-water-vine-air-fauna-flora. The maintenance of microbial life in the soil allows the vine’s roots to better draw on all the mineral elements necessary for its well being. This in turn is reflected in the wine through a greater aromatic complexity. We know that we are not the only ones who work the soil, it’s also why we must preserve the life of these organisms as they hold the key to the terroir. Thanks to this approach, our terroir reveals itself all the more in the richness of our wines. Ploughing and letting grass grow freely in alternate rows is a typical management practice in the vineyard. When the soil lacks mineral nutrients to rejuvenate the micro-fauna and flora, then we apply a certified « Bio » compost that we make. This approach is important in assisting us achieve healthy and well-balanced growth of the vines. 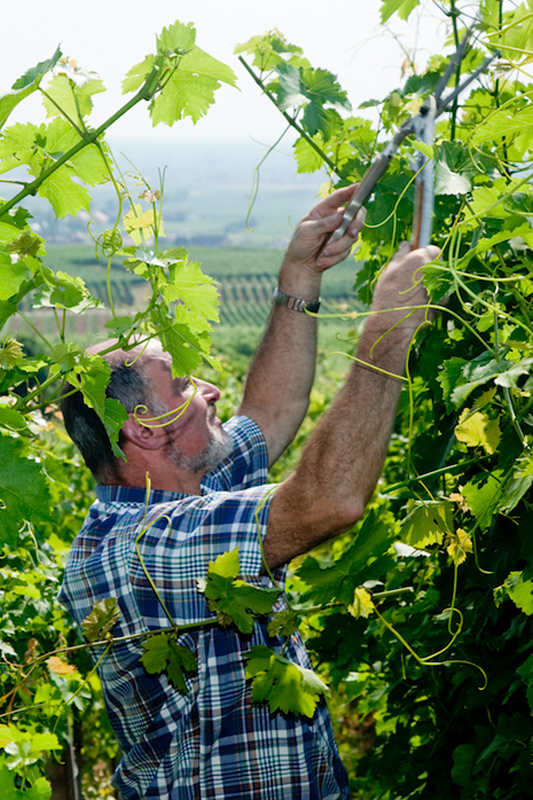 Pruning is carried out in a manner appropriate to each variety. Before harvesting, the grapes are evaluated to assess their degree of maturation. The harvest is exclusively hand-picked at optimum maturity. Thanks to lower yields, ripe, sound whole grapes are carefully delivered to the pneumatic press. Gentle extraction of the juice over 4 to 8 hours results in high quality unchaptalized musts where the mineral elements within the grapes have been released. Before arriving by gravitation in glass coated fermentation tanks, the musts are chilled (10 to 15 °C). In doing this, they are naturally clarified. After 12 to 24 hours of static settling, juices are racked. Thanks to temperature control during fermentation (between 12 and 22 °C), we produce wines that are rich and concentrated. Following fermentation, the wines are left to mature on fine lees for 6 months. Clarifying of the wines takes place in the spring of the following year. Varietal wines are bottled after 6 to 10 months aging. Terroir wines, « Vendanges Tardives » and « Sélection de Grains Nobles » are left to age for 12 to 15 months in « foudre » (very large oak barrels) where complexity is enhanced through micro-oxygenation. Thereafter the wines are bottled.